WoooooW, I am chosen to be one of few to be an EMC Elect. 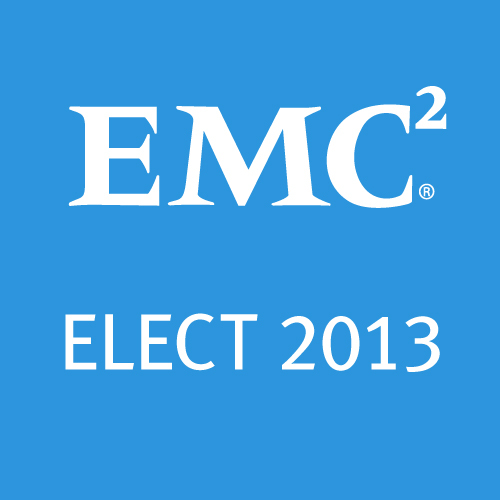 In November 2012 EMC announced a new recognition program called EMC Elect. This program provides community driven recognition to individuals who have demonstrated the highest levels of commitment to thought leadership in the fields of information management, Cloud computing, and big data. The scope of this award is unprecedented within EMC. The EMC Elect program has designed to span the gap between brand loyalty and brand advocacy. The idea of the program is similar to Microsoft MVP and VMware vExpert programs. Besides myself I congratulate everyone who has been selected as an EMC Elect too, I am truly honored and humbled to be selected to the EMC Elect community and incredibly excited to further promote the EMC brand and to help others in the community along the way. Thanks EMC. Note: Not all of the Symptoms listed above will be found in all Cases. However, each is indicative of index corruption; therefore the fixes listed below are relevant to each situation. The above noted error messages are typically the result of problems in the media database. Corruption in the media database could be caused by any number of events, such as hardware failure, or improperly shutting down NetWorker daemons. The general approach to resolving any fatal media database problem is to use the nsrim, and nsrck tools. If those tools did not solve the issue, so you have to proceed with scavenging the Media Database. Follow the steps listed below to perform media database compression and consistency checks to correct possible media database corruption. You may also follow this procedure to simply compress the backup server’s indexes (Client File Index, and Media Database) as part of periodic system maintenance. Make sure you have a bootstrap backup before commencing. BE VERY CAREFUL WITH THIS STEP, Please read it all before proceeding. In /nsr/mm/mmvolume6 delete all files EXCEPT the 4 files (ss.0, vol.0, clients.0, ss.1, vol.0 , clients.0,ss.1, clients.1, vol.2, ss.2, clients.2, VolHdr ) You MUST keep those files. NOTE: Be careful when deleting the files and make sure not to delete the (vol.0, ss.0, clients.0, vol.1, ss.1, clients.1, vol.2, ss.2, clients.2, vol.3, ss.3, clients.3, etc.) These files are NEEDED to rebuild the media database. If you do (# rm ss*), this will delete ss.0 also and basically the media db is gone. Note: this step is simply a way to force NetWorker to rebuild the media database. The files that are deleted are all rebuild-able from the media db file. The files mentioned above and cautioned to not delete them are not rebuild-able, NetWorker will not be able to rebuild your media db without these files (ss.0 and vol.0, volhdr, clients.0 , etc…) so take care well in this step. In the situation where the corruption is severe and the above procedure did not resolve the media database corruption, the media database can be recovered from the bootstrap using the mmrecov command to get a good copy of the media database. NetWorker software attempts to generate a bootstrap every day, so no more than one day of data should be lost. EMC NetWorker version 8 includes many features that make the solid backup solution even better. One of those is the Client Direct feature, also known as direct file access. This technology allows NetWorker client agents to backup directly to an advanced file type device (AFTD), or a Data Domain appliance using the DD Boost protocol. Previously, no client backups could be written directly to AFTD devices and only the NetWorker Backup Server, Storage Nodes and specific database backup Modules could write directly to AFTD & DD Boost devices. The ability for client backup data to bypass the Storage Node and write directly over the IP network to Data Domain eliminates the Storage Node as a bottleneck during backups. With DD Boost, in addition to client direct backup, Distributed Segment Processing (DSP) allows parts of the de-duplication process to be offloaded to the NetWorker Clients resulting in only new unique data segments being sent from clients to the Data Domain, dramatically reducing IP network traffic during backup. This will usually result in decreased I/O load on those clients during backup due to the lower processing requirements of data segmentation and fingerprinting versus having to read and transfer large volumes of data. This process would normally take place on the Storage Node, but with Client Direct enabled, the Storage Node simply manages the client without handling the backup workflow. Unless of course Client Direct is not available, in which case the data is sent through the storage node to be deduplicated and then transferred to the Data Domain. NW130259 – Restore of Exchange Database hangs. NW135097 – Exchange log files are not getting encrypted. NW133418 – irccd.exe crashing intermittently during Exchange 2010 backups. Technical Alert: Avamar VMware image backups created with changed block tracking (CBT) enabled might not be able to be restored. If you are using Avamar to backup VMware with Change Block Tracking (CBT) enabled,You have to check the following EMC Technical Alert , where under specific , limited circumstances, Avamar VMware image backups created with changed block tracking (CBT) enabled might not complete or may not be able to be restored either through the file level recovery (FLR) functionality or as a full image restore. RPC error: RPC send operation failed; errno = An existing connection was forcibly closed by the remote host. 74209:save: Quit signal received. If communication is good, check the ability to telnet your client from the backup server using 7937 and 7938 ports respectively. 2- Set TCP/IP keep alive settings at OS level. Also there are some recommendations by Microsoft TCP/IP tuning to avoid any TCP timeout issue. You need to apply those recommendations on the backup server and the client as well. Note: You will have to reboot the machines after applying those changes in order to take effects. Create the following DWORD values in registry.